I may not know who’s playing the game, but I know how to host an epic pre-game! Who is here for the snacks? Follow my tips to hosting an epic tailgate party this football season. Fall is here, and that means it’s the start of yet another football season. Now I have to be honest, I don’t know much about football. Before meeting Allison, I didn’t care much about it either. However, she went to the University of Michigan, and will not miss a game of theirs. So as a loving and supportive wife, I find myself yelling “GO BLUE” every Saturday while they play. What I can get on board with is ALL THE SNACKS! I don’t care who wins the game, but I do care what’s on my table when we’re watching that ball spiral through the air. So invite all your friends over for an epic football tailgate party with the best snacks ever. 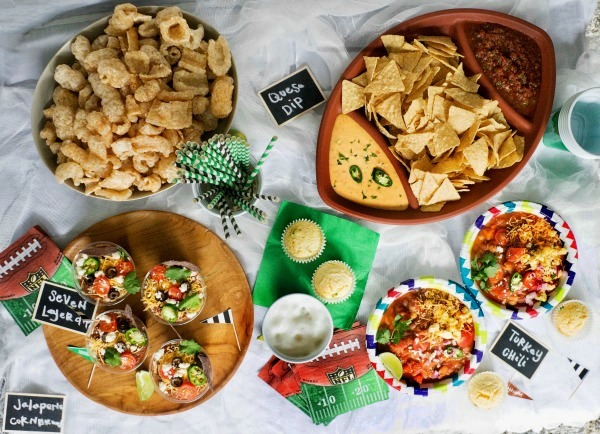 Throwing a Football tailgate party at home can be a bit overwhelming, but I’m partnering with Solo Cup to show you how to make it super easy on you, and super delicious for your guests. Don’t break the bank on decor for this tailgate party! I love getting a couple items at my local party store that can be used at a lot of different occasions. I happened to have some football napkins from last year lying around, so I put those out, but I picked up some green napkins to go along with the theme. I can always use these for Christmas or Halloween later on. I found these super cute football cupcake picks at my local party store that I can use on cupcakes or in these cute individual seven layer dips! I tossed some around the table as well just for an extra touch. 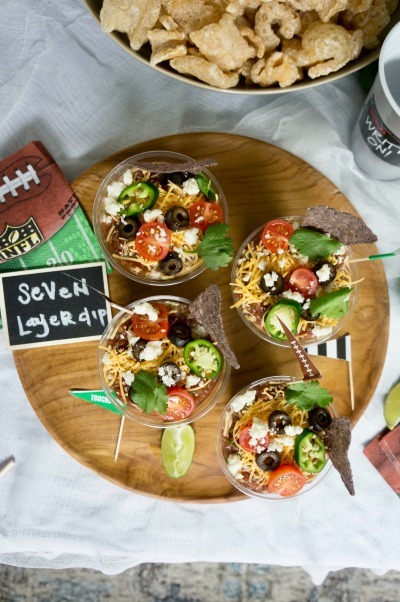 Everyone’s favorite tailgate party dip: the seven layer dip. 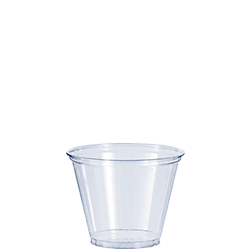 I wanted to make these fun for the kids as well as the adults, so I created individual servings using Solo’s 9 oz clear plastic cups. These cups were perfect for layering refried beans, fresh guacamole, sour cream and salsa. I love that you can see all the colorful layers in these clear party cups! I topped mine with jalapeños (because I like it spicy) fresh cilantro, olives and cheese, and inserted a chip on top and a football party pick for the perfect individual appetizer for my guests! 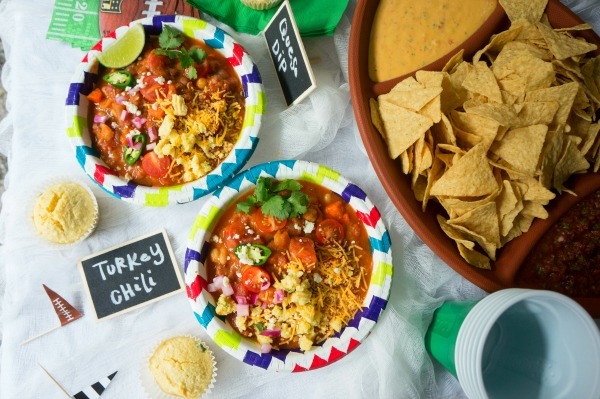 As a sidekick to the seven layer dip, I knew I had to make my delicious healthy turkey chili. My healthy turkey chili is always a crowd pleaser and the perfect main for any football party. My guests always love to fill up their colorful solo bowls with a hearty serving of chili, and top with their favorites. Fresh tomatoes, jalapeños, onion and cheese are my go-to toppings for any chili bowl, what are yours?